Well, most of you have noticed that I have been away for a while. Noticed that I have not been over to FoodBuzz, nor creating waves over at ChefTalk. I have been through a couple of life changing events (all good) over the last 6 to 8 weeks. I have changed jobs for one. As much as I love being a fishmonger and helping folks out with their fish buying and preparing, I had to make a change for the commute was killing my pocket book. You see, the second life changing event moved my and my family out to the country. We now live in beautiful Lake Stevens, Washington, with a hilltop view of the lake and big chunk of the Cascade mountains. We are so lucky to live where we do. I will post some of the new fish recipes I have been trying out over the last couple months over the next few weeks. I am looking forward to getting cought up with you. Fish is easy. I wont blow smoke here, it can be made difficult. There are some outstanding recipe's out there that can take hours to prepare, and you will be well rewarded when you are finished. But, the fundamentals of preparing fish is what I am talking about here. Anyway that you can prepare chicken, you can do the same with fish. Bake, grill, poach, pan fry, deep fry, plank, soup, stew, smoke, braise, roast, and can. There are even some things that you can do with fish that I would never suggest you do with chicken like; raw, rare, pickled, salted, cured, and open-air-dried (recipe coming soon). Just a few things to remember when cooking fish: 1) Most fish likes to cook hot and fast. 380-400 degrees in your oven or grill. 8-10 minutes per inch of thickness. 2) Most fish takes to simple seasoning. Salt, pepper, and some sort of citrus will take you a long ways. 3) Do NOT portion your fish before you cook it. 4) The fresher the better. Talk to your fishmonger. If you are scared or just don't want to do it yourself, have them trim, skin, and/or steak it for you. If you are looking for special cut or trim, ask them to do it for you. That is why they are there and they (well, I do anyways) like to show off my skills as a cutter. Furthermore, I want you to come back. You do NOT have to buy a whole pound of anything. If you want 8oz, make them cut you 8oz. If the customer asks me questions about a particular fish that they have never tried, I will tell them to get something they know they like, and I will cut a small portion of the curious fish and tell them how to prepare it for free. I would much rather a customer have a great experience than to try to sell them something that they may not care for. Sorry, I got nothing for the stink. Even in my house, almost all my fish is cooked outside. Anything that can be cooked on the grill or gas burner is done outside. Other than that, ummmm, well...........I got nothing. Any suggestions here I would be happy to hear and share them. Most definitely, some fish can be outrageous in cost. There are more variables for this than I wish to get into here. Shop around. Spend your time on the phone calling around asking what is fresh today and how much it is. You will find a huge difference in price from store to store. And when you find the cheapest price in town, call your favorite fishmonger and ask if he/she will match price. I do it all the time. With all this said, I am looking for questions from you. Ask them. I am sure that you are not the only one wanting answers to that question that has been nagging at you. 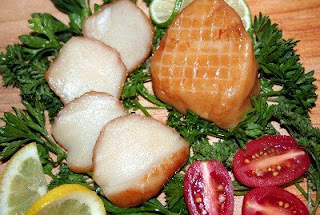 Oh, I almost forgot.... That picture is of Alder Smoked Sea Scallops. These are the most fantastic scallops to experiment with. Try them on top of your salad, or layered on top of your pasta. Fantastic! A must try. Ono, or Wahoo is mild, flaky white fish that takes to smoke like a fish to water. The title of the post of interest is "Illegal or Not?" I found this killer blog on Foodbuzz.com and just had to share it with all you. It brings up a sticky subject in a very entertaining way. Make sure you read through ALL the comments. They are just as entertaining as blog itself. This blog has just found a subscriber for life. Labels: a food blogger "Must Read"
Here is a recipe that is a Hawaiian staple. And for every family, there is their own special twist that makes it unique. The only MUST HAVE is to use the absolute freshest fish available. 1 lb of one of the following: Tuna (Ahi or Albacore), Bonito (Aku), Marlin (Nairaga (Striped) Hebi (Spearfish) or Kajiki (Blue)), Salmon, Opah, (prepared) Squid or Octopus (tako). You can also use Tofu. Cut fish into 3/4 inch cubes and set aside at room temperature. Prepare your dried Ogo or Nori by placing it in a cup of water, covering it completely. Let it stand for about 5 minutes. Remove from water and squeeze out the excess. Chop it into 1/2 inch pieces. Add it to the fish. Add Salt and Sesame oil to the fish and mix well by hand. For best results let it stand for about an hour at room temperature and then serve. If you have any left overs the next day, throw them in a hot pan and fry fast until the fish lightly cooked and serve over rice. This is a very basic recipe and lends itself to so many variations. Experiment and have fun with it. Leave a comment and let us know what you did make it uniquely yours. "The health benefits of eating fish, far out-weigh any risks of eating it"